These new works emerge, so close to completion and yet still some layers to go. 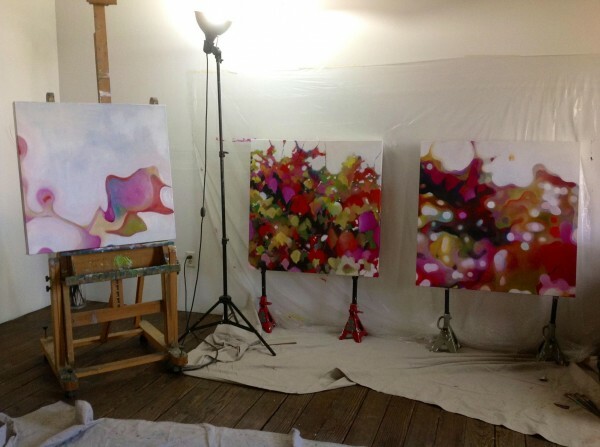 I realize that looking at my work is such an integral part of my process. I look at them for probably longer than I spend actually applying the paint. Really, the very final part is putting brush or tool to canvas. These works have been years in the creation, starting back in 2010 when I took photographs of some foliage at the side of the street that made me stop in my tracks. Since then, the idea has percolated, fermented, evolved through the months and years to bring me to today. Although it takes months, painting them really is just the tip of a very large iceberg. In fact, I can trace the beginnings of these back even further without stretching too much. It reminds me that one of the greatest, or perhaps the greatest, thing about living life as an artist is that we get to truly understand and express ourselves through our slow and rigoros explorations. It may not be something we are aware of everyday with the usual pressures of life weighing on us, as it does on everyone. Most careers or jobs have rewards that are intangible; for artists, I think the rewards is the time to explore and understand. I will look at these tomorrow, for a long time, as it is important to be able to really see them, as it so easy to let the paint control the artist, rather than vice versa. I’ve more looking to do with these, and a little more application of paint too. I can’t wait to see them finished. Next post: Paintings from the Hedge: New work!